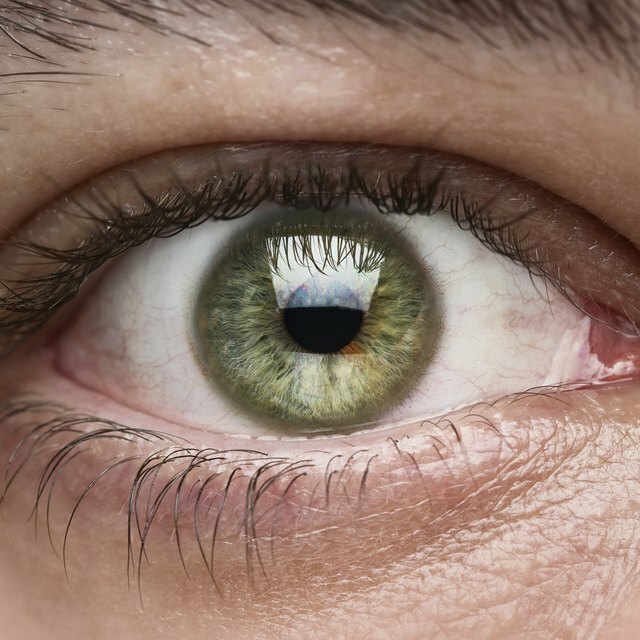 What Organs Work With the Eye? The eyeballs of humans and the eyeballs of cows have a similar structure overall. Both have the sclera, which is the white part of the eyeball, cornea or the clear structure over the iris and pupil, lens, vitreous fluid, retina and choroid. The choroid is the layer of the eyeball that is between the retina and the sclera. Despite the many similarities, however, there are significant differences between a cow eye and a human eye. The radius of the average cow eyeball is a little over 1/2 inch (15mm) with a diameter of 1.2 inches (30mm). The human eyeball size varies, but on average its diameter is about 1 inch (24mm). A cow eyeball and a human eyeball are similar in overall appearance but the parts of the cow eyeball are generally larger than in a human eyeball. Apart from the size differences, a cow and a human eye are quite similar in overall structure. A key difference is the shape of the pupil, which is oval in a cow eyeball and round in a human eye. The iris is a cow eyeball is almost always brown, while human irises come in a variety of colors. Human eyes also have a higher number of attached muscles than a cow eyeball. If a cow looks into the light of a car, or if any other light is shone on their eyes, their eyes look like they are glowing. If you did the same thing to a human, this would not happen. This is caused by the tapetum lucidum in cows, which is an area of chartreuse pigment located just below the retina at the level of the choroid, in the back of the cow's eyeball. The light that enters the eye reflects within the eye and amplifies low levels of light, which improves their vision at night. Cows can see color, but the distribution of rod and cone cells in the cow's retina is different from the distribution in humans, so that cows does not perceive colors the same way humans do. It's hard to tell how cows see colors, but the way the rod and cone cells are spread out in the retina shows that they can, in fact, differentiate between colors like red and green, blue and yellow, black and white, but in a less advanced way than humans do. We know how the tapetum lucidum increases the cow's night vision ability, but the internal light reflection that it causes can affect their vision in the daytime. There's no real way to know for sure, but by looking at the retina and visual system of cow eyeballs is it thought to believe that cows can see at a level equivalent to 20/80 in the daytime. Cooksey, Alison. "What are the Differences Between a Cow Eye & Human Eye?" Sciencing, https://sciencing.com/differences-cow-eye-human-eye-8122273.html. 24 April 2018.